Can we all just agree that we are tired of eating cupcakes? ...Ok, now that we are all in agreement, let’s go back to eating cake. 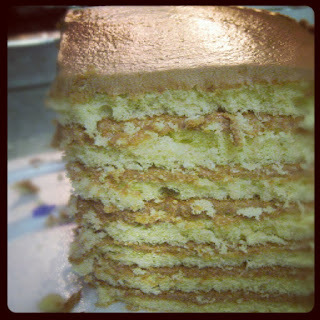 This cake: Dean’s (slap-yo-mamma) 7-Layer Caramel Cake from Andalusia, Alabama. I bring this up because J and I are doing a juice fast this weekend in an effort to reset our taste-buds. So, naturally, my daydreams are vacillating between bacon cheeseburgers and my favorite store-bought cake in America. Ugh. Yum. Aunt Dean’s got it down, y’all. She recognizes cake for what it really is: a skeleton for its muscle, a frame for its drywall, a blank canvas for its Chagall, a set-worker for its Madama Butterfly. What I'm trying to say is: the true star in Aunt Dean’s cake is the icing. Oh, the icing! Her caramel spread has a contrasting sweet and smoky bite and that will make you wonder if there was an epic battle for good and evil fought in its fruition. Holy moly, it's good. I admit, I'm so in love with the caramel, I've yet to venture out and try her many other cake flavors. Aunt Dean's website says her cake business all started with a Sock-It-To-Me accident. (How’s that for intrigue?) It also includes all the local places you can pick them up. I usually get mine at Allegri Farm Market in Daphne. So tell me... what's your favorite cake? Oh.....I will never, never not eat a bite of this cake. Well good, cause your bday is coming up!